This past Sunday, hundreds of people, Jewish and non-Jewish, packed into the Choral Synagogue on Pylimo Street to launch the happy holiday of Hanukkah (Khánike in Yiddish). After the prayer service led by the city’s universally beloved cantor, the Rev. Shmuel Yusem, there were speeches by the head of the general and religious communities, and the Israeli ambassador, followed by a concert, including master violinist Boris Kirzhner who mesmerized the crowd. A very young rabbi visiting from Vitebsk spoke about the holiday. As ever, the highlight was the lighting of the first candle, the first of eight for the eight consecutive evenings of the holiday, until the last day when all are lit. The Hanukkah candelabrum is called the menorah (menóyre in Yiddish, menéyre in deep Vilna Yiddish). It actually has nine branches. The ninth, distinguished spatially in a variety of ways (often just higher), is called the šámes in Yiddish, which means the “assistant” who assists in the lighting of the eight candles-of-the-days-of-Hanukkah proper. The usage has a certain humour because the šámes is usually the guy in the synagogue who gives you the prayerbook, shows you to a seat, and the like. Although today’s Vilnius Jewish community of around 2,000 people is a remnant of around 100,000 at its peak (60,000 during much of the interwar period, 80,000 on the eve of the Holocaust), it is a vibrant and diverse community whose very different (and sometimes disagreeing) groupings are a sign of vital life (well, usually). The greatest achievements in the quarter-century since Lithuanian independence are those of Lithuanian Jewish people themselves, but there has been outside help, most critically and generously from the US-based Joint Distribution Committee, founded in New York City in 1914. Over the century, “The Joint”, as it is intimately known, has more than once been the only organization to rescue Jewish people in times of acute crises, particularly wartime. But after the collapse of the USSR a quarter century ago, its main mission became to help the remaining Jewish communities of Eastern Europe to themselves rebuild Jewish life in whichever of its forms they choose, ranging from extremely religious to extremely secular, and always staying out of all the politics. The results speak for themselves. East European Jewish communities are back on the map of twenty-first century history. But the central Jewish community’s celebration at the Choral Synagogue is not the only Hanukkah celebration in town. Of course, many of us threw private parties at home, emphasizing the ties of friendship and closeness among all the peoples of this great city. But this year, a new Jewish restaurant in town called in the holiday in style. Alexander Aronchik, a young Vilnean who earlier this year established the city’s only kosher restaurant (at present), led the proceedings at Aronchik’s Restaurant. Well, okay, it’s officially called “Rishon,” Hebrew for “first”, but our city has already named the place “Aronchik’s Restaurant” and once something in Vilna Jewish lore gets named in popular parlance, it’s a real question of whether the official name even stands a chance. Check it out and see how Vilnius multiculturalism grows by the year. It’s at Tilto 3, a few minutes’ walk from the central Cathedral. But for many Hanukkah-conscious Vilneans the main Hanukkah event is yet to come. That is Rabbi Sholom-Ber Krinsky’s huge outdoor, all-weather menorah at Kudirkos Square on Gedimino Boulevard, right across the street from the Novotel. The rabbi, who will be lighting the city’s menorah for the twenty-second (!) consecutive year, is hoisted up on a crane, with a different person from the crowd invited up for lighting each candle. Over the years, the roster has included ambassadors from over a dozen countries, a prime minister, speakers of parliament and some everyday Jewish people of every background. That’s this Thursday, 10 December, at 6 PM (1800) sharp (or, well, in Jewish time, almost sharp). The more rain or snow, the more fun (but bring an umbrella). 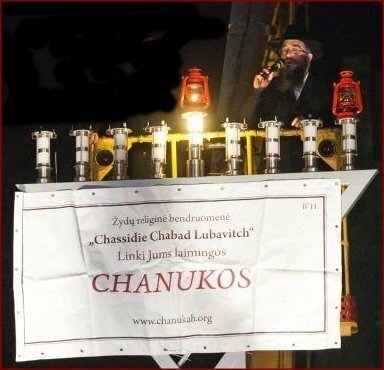 Rabbi Krinsky, a native of Boston, Massachusetts, settled here over two decades ago, representing the Chabad-Lubavitch movement, a “Lithuanian branch” of the wider non-Litvak, Polish-Ukrainian-Hungarian hasidic movement. They’re headquartered on Bokšto Street (at the old Barbakanas Hotel), where holiday celebrations draw huge crowds and all is done according to tradition (and where there is, by the way, a soup kitchen for poor Jewish and non-Jewish people). 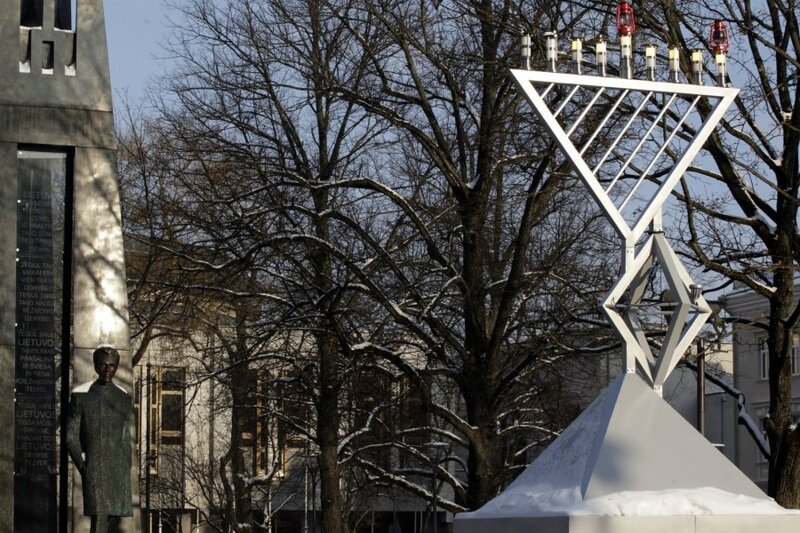 It was in the United States that the late Lubavitcher Rebbe (grandrabbi) succeeded in making the huge outdoor Hanukkah menorah a symbol of common human celebration and love transcending factional differences. So much so, that even us, diehard followers of the non-Chabad Litvak rite of Vilna, have embraced the outside menorah wholeheartedly. Something that brings happiness all around has to be cool, not least in tandem with traditional Hanukkah foods such as látkes (pancakes, for Litvaks invariably búlbene látkes — potato pancakes, though out west in Zámet, or Žemaitija, they were called búlvene látkes, because there, under the impact of the Lithuanian language, the Yiddish word for potato was búlve). Hanukkah celebrates the successful result of the Jewish rebels in the ancient Land of Israel under Judah Maccabee against the Greeks’ Seleucid empire which was imposing abandonment of Jewish customs and forced Hellenization. The rebels retook the ancient temple in Jerusalem, and though they had only enough oil to burn for lighting one night, it lasted, by Jewish tradition, eight nights, by a miracle of the Almighty, giving the revolt a religious significance. The theme of freedom from tyranny was and is close to the heart also of secular Jews, hence the holiday continues to exert its attraction over all sectors of the community, and of people generally. 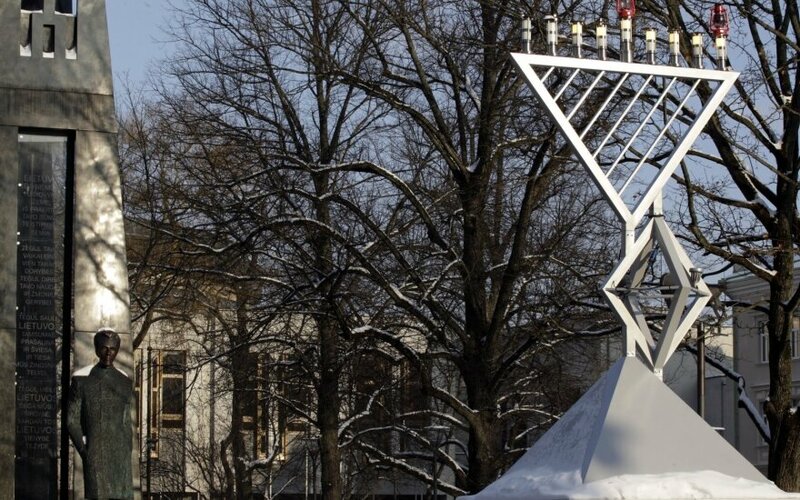 Speaking personally, I will all my life recall with affection the Vilnius Hanukkah parties I visited in December 1990, when freedom for Lithuania became the toast at every table, seamlessly weaving together a minority’s traditions and the call of the historic hour. Never mind that Judah the Maccabee’s retaking of the temple is dated to 165 BC. That is one of many examples of the adage that “Jews have a long memory”. That, in turn, was supposedly said by Napoleon during his summer 1812 sojourn in Vilna, which coincided with the mournful, melancholy Jewish holiday of Tíshebov (Tisha b’Av, Ninth of Av) that year, when he saw thousands of Jews sitting on the floor and weeping and wailing. When he asked what they are crying over, and was told it was the destruction of the first temple in Jerusalem in 586 BC (and the second in 70 AD), he made his observation, according to lore, about the Jews’ long memory, and went on to name the city “Jerusalem of Lithuania” (though the idea is there in some older Jewish sources). For many centuries, Jewish law looked down at virtually all forms of gambling. There are treatises against the evils of card-playing for money and other such games. When there are many laws, injunctions and amendments against doing something in any society over centuries, you can be sure that whatever it is was done a lot. It’s almost as if the most austere rabbis felt that there just needs to be some release for that particular human passion. The answer was Hanukkah. On Hanukkah children (and not only children!) play the game of dreidel (dreydl), often for some small pieces or chits, or for actual coins or other items of value. In fact, giving children coins, or more allowance than usual, became part of Hanukkah, too, in its later incarnations, the gift known in Yiddish as khánike-gelt (Hanukkah money). Hand-made Lithuanian dreidels. Most have the traditional four sides but two are unusual with two or eight sides. Courtesy Virtual Yiddish Mini-Museum of Old Jewish Vilna. The dreidel is a four-sided spinning top, historically related to the European teetotum. Traditionally, each side has one of four Jewish letters: nun (n), giml (g), hey (h) and shin (sh), which can refer to the Hebrew sentence “Nes godoyl hoyo shom” (There was a great miracle there!). But they primarily signify the four Yiddish words referring to the game at hand: neyn or nit (no, not, zilch), gut (good), halb (half) and shlekht (bad), meaning that if the dreidel lands there, the result is, respectively: nun—nothing happens; giml—you win the whole pot; hey—you win half the pot; shin—you lose (one, some or all, depending on the rules adopted; if you’re out of luck, you may then try to “borrow” from others to continue playing). 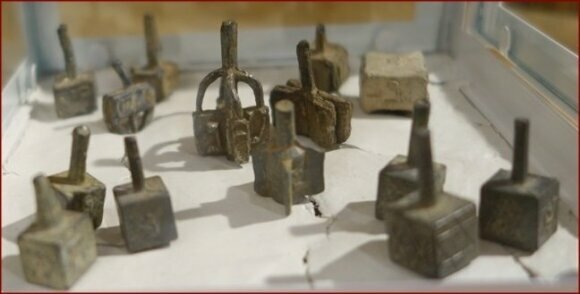 For hundreds of years, Lithuanian dreidels were hand-made from molten lead and varied quite a bit. Here are a few “dancing dreidels” from our virtual mini-museum’s collection. For Litvak connoisseurs, the actual Litvak word for dreidel varies across the vast territory of historic Jewish Lithuania: gor in the east, dreydl in the center, and varfl or verfl in the west (in Zámet or Žemaitija). Some decades of expeditions in Litvakland have yielded our atlas’s map for the words for “dreidel” in Jewish Lithuania. It is perhaps only to be expected that Israeli, American and Russian greetings for Jewish holidays and other events would became popular here too, and the best of luck to them. We of the decimated East European Yiddish tradition, and more emphatically of the even smaller Litvak tradition, continue to hope that traditional Litvak Yiddish greetings will find their place in the new cultural economy here and will not be altogether forgotten. After all, the Litvak culture that thrived here for some seven hundred years in all its internal variation, was not actually the culture of today’s Jews in Israel, America or elsewhere. It was the Jewish culture of Lithuania. On Fridays, before the dusk onset of the Sabbath, it’s A Gutn Shábes! (A good Shabbos!). And when the Sabbath is out and it’s back to the week after dark on Saturday, it’s A Gúte Vókh! (A good week!). For Hanukkah it’s A Fréylakhn Khánike (A happy Hanukkah!) or A Líkhtikn Khánike (A Hanukkah full of light! ), or more mischievously, Farshpíl nit in dreydl! (Don’t lose your game of dreidel! ).